Many organisations are keen to understand the psychological profiles of their leaders as this may impact on the strategic viability of the organisation and guide people management initiatives related to placement, succession, team compilation and development. This brief write-up describes the cognitive and competency profiles of a sample of 148 managers and executives (of which 122 were males and 26 were females) from a leading South African Insurance firm. All the test subjects had degrees and multiple degrees in business and finance as well as ample industry-related experience. Assessment was conducted by means of the Cognitive Process Profile (CPP), assessment centre exercises and 360 degree evaluations of the test subjects by peers, subordinates and superiors. In terms of work-related complexity, the managerial and executive positions largely reflected Stratified Systems Theory (SST) Level 3 (Tactical Strategy) and Level 4 (Parallel Processing) work. The majority of the sample showed a preference for Logical-analytical approaches to problem solving. Many also capitalised on Memory, which shows a reliance on knowledge and experience. This is a relatively common tendency among professionals and specialists. Most of the subjects involved combined a rigorous logical approach with a learning orientation in that they sought out challenges and quickly adapted to unfamiliar task requirements. Fewer subjects (approximately a third of the sample) showed the tendency to combine a logical approach with an ideas oriented approach – which is ideally required for purposes of strategic thinking. The stylistic preferences of this group of managers and executives were generally effective and few showed any tendency towards reactive and trail-and-error approaches to unfamiliar cognitive challenges. The positions involved, largely entailed SST Tactical Strategy (Level 3) and Parallel Processing (Level 4) work. Tactical strategy work entails dealing with interactive elements in tangible systems, and Parallel Processing work involves the integration and contextualisation of fuzzy, intangible and dynamic systems. The subjects in this sample were largely found to deal with complexity at the required Tactical Strategy and Parallel Processing levels. A number of individuals even showed cognitive potential to deal with the chaos and emerging patterns characteristic of Pure Strategic environments. These distribution curves differ from that of the normal working population where approximately 80% of people prefer hands-on, technical and operational work and only a fraction of a percentage point tends to deal with the complexity of a Pure Strategic nature. The competencies of the subjects were measured by means of 360 degree and assessment centre methodologies. The results of the 360 degree evaluation significantly correlated with the current and potential levels of work results as indicated by the CPP at the p < .02 level of significance. 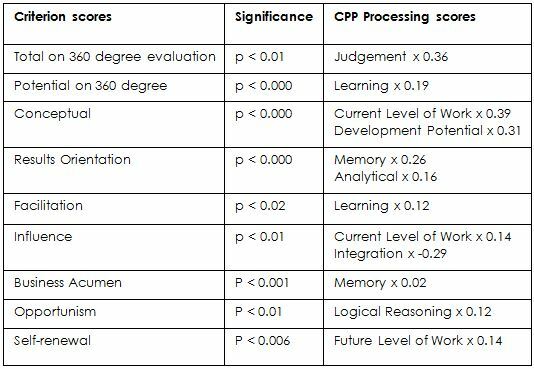 In addition, the 360 degree results also significantly correlated (at the p < 0.00 to p < 0.04 levels) with the Analytical, Logical, Memory, Integrative and Learning processes as measured by the CPP. The Assessment Centre results significantly and differentially correlated with certain CPP processing skills with correlations primarily ranging from .35 to .57. 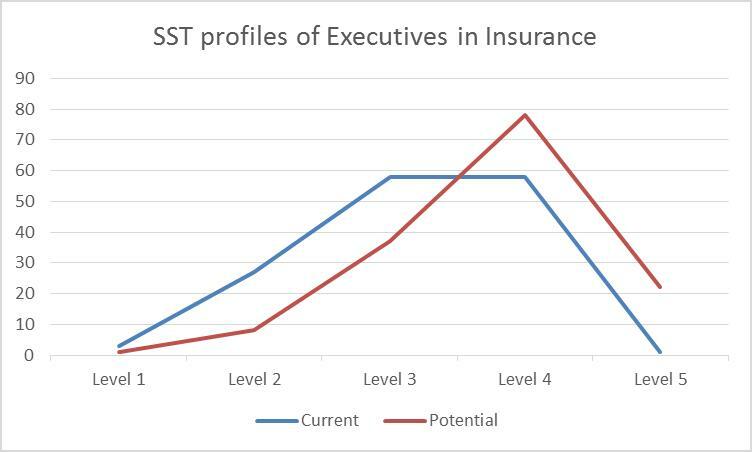 The “Conceptual” competency result significantly correlated with most of the CPP processing skills as well as with the CPP’s indication of the current and potential levels of work; “Results orientation” with the current and potential levels of work as indicated by the CPP as well as with Logical reasoning, Memory and Learning; “Business acumen” with the current and potential SST levels of work and with the Memory, Judgement and Learning processes; “Self-renewal” with the cognitive mode of “Challenge seeking” and with the processes of Integration, Judgement and Learning; “Facilitation” with the Logical reasoning, Learning and Memory processes; and “Opportunism” with Logical reasoning, Verbal conceptualisation and Learning processes. The insurance industry normally involves a relatively structured and well regulated environment for which financial and IT knowledge is required. Strategically however, it poses definite conceptual and creative challenges. Exposure at managerial and executive levels in the insurance environment is therefore likely to contribute to the development of a broad range of cognitive skills. In terms of the Stratified Systems Theory (SST) the work primarily entails Alternative Paths and Parallel Processing requirements. The majority of the respondents also showed the tendency to function at those required levels. The results of this study provides an indication of the effectiveness of current selection, placement and succession practices in this particular organisation; the capability levels and competencies of the leadership team and factors to be considered for future succession planning and intellectual capital management practices.